The government has ordered the Navy to sign agreements with 36 countries and three multi-national constructs to share real-time maritime security information in the Indian Ocean Region. NEW DELHI: Union Defence Minister Nirmala Sitharaman on Saturday inaugurated the Information Fusion Centre (IFC) at Gurugram which will share real-time maritime security information in the Indian Ocean Region (IOR) with 43 countries that have signed agreements with India. 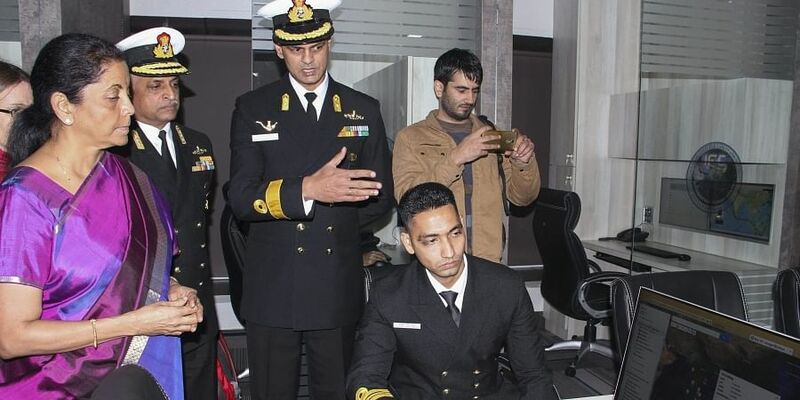 Chief of Naval Staff Admiral Sunil Lanba and several foreign dignitaries and officials were present at the inauguration. The government had issued a mandate to the Navy to sign such agreements with 36 countries and three multi-national constructs in order to expand its information-sharing network. The Navy has already signed the agreement with 21 countries and 12 of those have started sharing live feeds. One Multinational construct, Ascension Agreement to the Trans Regional Maritime Network (T-RMN) with Italy was signed recently which is a block of 31 countries. The IOR is vital as more than 75% of the world’s maritime trade and 50% of global oil passes through the region. However, maritime terrorism, piracy, human and contraband trafficking, illegal and unregulated fishing, arms running and poaching pose myriad challenges to security in the region. The response to these challenges requires enhanced situational awareness which will enable security agencies to function effectively. At any given time, there are about 1 lakh big and small boats sailing in the region. The information exchange would initially be based on telephone calls, faxes, emails and video conferencing. Subsequently, to enable better interaction, quicker analysis of information and to facilitate timely inputs, the centre would host Liaison Officers from countries that have signed the agreement with India.